This month's theme is the word "No" on a sign in your city. No matter how you say it in your language: nae, nahi, ne, neen, nei, nein, ní hea, nie, non, nu, nyet or just plain NO, have a great theme day. I hope you can visit as many of the other participating blogs as possible. I see you found an adorable No sign. A famous one too. The roof on the state house is gorgeous! Is it made of what it looks like it's made of...gold? 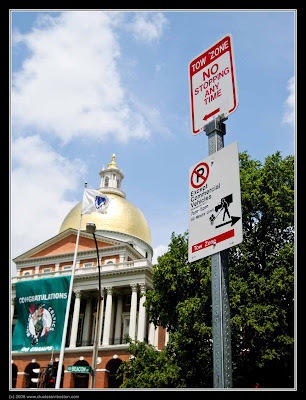 We have no parking signs all around the state buildings, too. I guess every state does, really. There's always a state trooper in a car posted on the sidewalk near the capitol. I don't know if I mentioned this or not, but I was happy the Celtics won! Excellent photo! Love the "discreet" sign there! Didn't you mention your son love basket ball? he must have enjoy the season!! A classic spot for this theme day! "Discreetly"? ;-) Great choice for the theme day! I would get giddy from two signs telling me different things in different directions. Always get confused about the difference between "No Parking" and "No Stopping". Loved the interesting photo, but also loved the post that went with it! Ah ya, great composition. I love the combination of golden dome and that sign... congrats! Lovely photo. Wonder if we'd find any Yes signs, if that was the Theme! Beautiful state building.